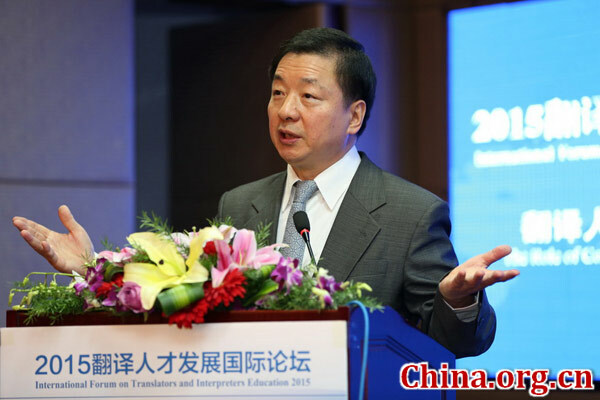 On Dec. 12-13, the first International Forum on Translators and Interpreters Education was held in Beijing. More than 350 professionals in the field of translation, from China and all over the world, shared their opinions on education and future development of translators and interpreters. The following summarizes their comments. Media translation demands better capabilities in information sensitivity and language expression. To develop lifelong education for translators and interpreters should focus on both knowledge and skills and application of new technology. The media industry faces intense competition; only by applying advanced technology can any media company take the leading position in the field. Whether a piece of information is valuable or not depends on how well it is communicated. Only information that is worthy of being communicated can be called truly valuable. Thus, media translator should improve their information sensitivity and insight, seek fresh and profound content, and keep pace with new technology in order to be a competitive talent. The translation industry is facing a rapidly growing and profound transformational period, which is not only an opportunity, but also a challenge. We believe Chinese translators and interpreters should not only serve the country's reform and opening up and promote China's economic and social development, but also contribute to better global communication and achieve a win-win situation among different cultures and civilizations.